Yoga with Melissa 75 is on the Kleshas. Patanjali refers to as the 5 causes of suffering as the kleshas. According to the Yoga Sutras the mental/emotional causes of suffering are 1) unawareness, 2) egotism, 3) clinging to past pleasure, 4) aversion to past pain and 5) the fear of death. We will explore the concept of kleshas within the context of this hatha yoga class. This hatha yoga class on the kleshas begins with a book reflection and then guided reflection on the kleshas. We move into some hip releasing yoga postures with pigeon and cow’s face pose. We then move into some sun salutations. 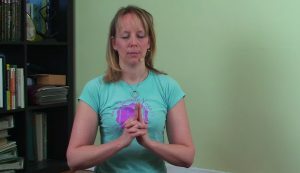 We continue the hip opening theme with triangle pose and half moon balancing pose. The hatha yoga class rounds out with some seated twists and a mudra.